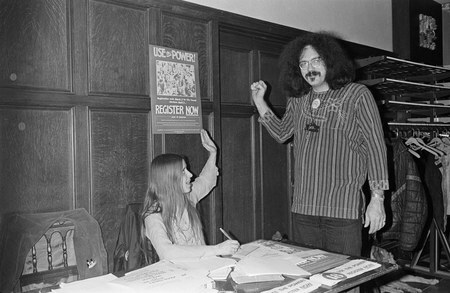 Posted on Thu, Dec 1, 2011 : 7:16 a.m.
John Sinclair had the worst seat possible for the freedom rally held in his own name at Crisler Arena on Dec. 10, 1971. But he didn’t miss a minute of the show. Sinclair, then 30, was sitting in his cell at the state prison in Jackson throughout the concert, serving 10 years for giving two joints to an undercover police officer. But he was listening in on a transistor radio to the WABX-FM broadcast of the event, which featured, among others, John Lennon and Yoko Ono, Bob Seger and Phil Ochs. Even 40 years later, Sinclair, who is seldom at a loss for words, struggles to describe the experience. “I was gassed about it,” Sinclair recalled last week during a phone call from Ghent, Belgium. “It was just very, very heavy. It was also scary, he said, since he used his weekly call to his wife, Leni, to call in to the concert and have his words broadcast throughout the arena. “Then I figured all weekend I figured when the warden came in and heard the report of the phone call, my goose would be would be cooked." Still, Sinclair recalled, it was worth the risk. Ironically, instead of waking up Monday morning to a punishment, he learned that he was going home. On the day before the concert, the Michigan State Senate voted to remove marijuana from the state’s penal code for narcotics and to reconsider all existing convictions. “We’d won before they even played a note,” he said. More importantly, after two and a half years in prison, he was going home to his family. Although his release was secured through a twist in the state’s political machinations, Sinclair believed then—as he does today—that his release came about in part to the hue and cry he and his supporters raised about what they saw as political and social persecution. Today, Sinclair remains a staunch pro-marijuana advocate—particularly for medical reasons—and said that his and his compatriots’ efforts during the 1960s and 70s helped to break down the stigma attached to its use. “There was nothing wrong with marijuana then and there's nothing wrong with it now,” he said. Sinclair, who today, at 70, splits his time between Detroit and Amsterdam, will be back in Ann Arbor on Dec. 9 and 10 for a two-day Ann Arbor District Library event commemorating the 40th anniversary of the Freedom Rally. He said he’s particularly gratified to see their efforts being recognized for their contribution to Ann Arbor’s history. “Everything we did in the ‘60s and ‘70s has been erased from modern life, because they don’t want people to do it again,” he said. “They don’t make movies or TV shows about hippies and dope fiends like us. He said he also plans to attend the Friday reunion of former residents of the two houses on Hill Street that were the headquarters of Sinclair’s White Panther Party. Tue, Dec 13, 2011 : 2:52 p.m. I've known John, Leni (his former wife) and Celia (his daughter) for close to twenty years. Amazing people, one and all. I've worked with John and with Celia. Anyone who thinks that John's contribution to American life began and ended with his activism in the late 60s/early 70s is misinformed. He has been a lifelong champion of causes he believes in, particularly American music. He has continually created outlets for him to share his incredible knowledge of great American music and the people that make it, through organizing concerts (notably the Ann Arbor Jazz and Blues Festivals and the great recordings of those concerts, as well as helping to organize many of the former Professor Longhair Piano Night concerts in New Orleans), years of volunteer radio DJing (for which he is greatly respected by those of us in the music community), and his poetry honoring the legacy of many great jazz and blues musicians, many of whom he knew personally or worked with directly. John is the real deal, I'm proud to call him a friend. Thu, Dec 1, 2011 : 6:26 p.m. I was there 1968 ti 1971. All John All The Time. Same as it ever was. Thu, Dec 1, 2011 : 2:51 p.m.
Thu, Dec 1, 2011 : 2:35 p.m.
Good post Sherry. John had a career before and he has a career today. The really sad part is the fact that our society has learned virtually nothing since then. The gov't is still wasting money busting otherwise innocent, mostly young people and we are no &quot;safer&quot; from the &quot;reefer madness&quot; than we were 40 years ago. Society has failed to learn the simple lesson that, when you are hitting yourself in the head with a hammer, it feels a lot better when you stop! Thu, Dec 1, 2011 : 7:51 p.m.
Thu, Dec 1, 2011 : 5:50 p.m.
&quot;when you are hitting yourself in the head with a hammer, it feels a lot better when you stop!&quot; And when people stop smoking pot the fog clears. Thu, Dec 1, 2011 : 2:23 p.m. I was there the night he was busted for those 2 joints. It was unbelievable to watch the oakland county sheriff beat him in the face bad breaking his glasses and he was bleading by his eye. He was not resisting arrest and treated like a bad criminal. I would really like to meet him and talk about what happened that night at the loft. He hasn't made a career from this he already had one. Thu, Dec 1, 2011 : 1:12 p.m.
&quot;They don't make movies or TV shows about hippies and dope fiends like us.&quot; Yeah, I don't recall ever seeing a movie about the 60s or stoners!!! Thu, Dec 1, 2011 : 5:47 p.m. He should go see a Harold &amp; Kumar movie if he wants to see a stoner movie. But I'm guessing he more likely wants to see a movie about himself which will never happen, because he really was nothing more then a stoner. Thu, Dec 1, 2011 : 2:32 p.m.
Thu, Dec 1, 2011 : 1:50 p.m.
should we compile a list for old John? Thu, Dec 1, 2011 : 12:36 p.m. This guy managed to turn 2 joints in to a &quot;career&quot;. Ain't America grand?